Spring is almost here and we know that locals and tourists are looking for exciting bike trips, exploring different places around the city. So we (flattire) decided to give you our top 5 recommendations for going on a bike ride around Amsterdam. If you are a beginner who loves following a light route, with no elevation, this is the perfect choice for exploring one of the gems around Amsterdam. The good part is, you can start this bike trip in the city centre of Amsterdam or Amstelveen by simply following the Amstel river heading south for about 10 km. On the way there you’ll be able to see the scenery that inspired Rembrandt in his landscape paintings, such as windmills, pretty skies, but also animals. Moreover, you can spot the statue of the great Dutch painter. 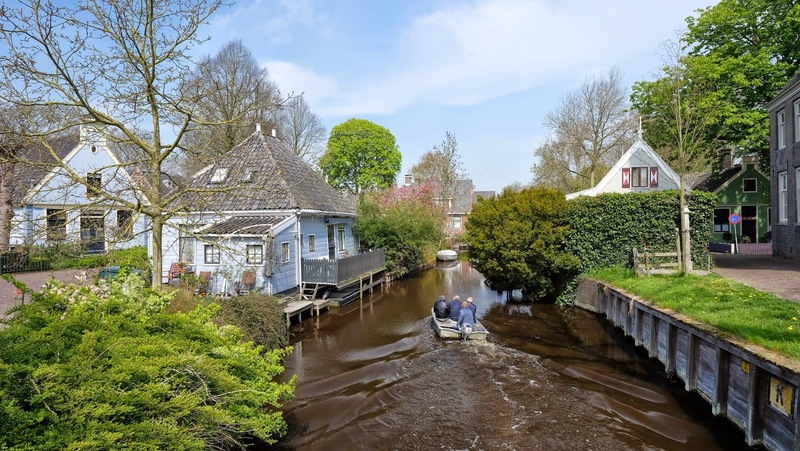 When you reach the destination, you will discover that Ouderkerk aan de Amstel is a small village with historic sites, such as Beth Haim of Ouderkerk aan de Amstel, the oldest Jewish cemetery in the Netherlands. You can also spend your day at the Ouderkerkerplas (The Lake of Ouderkerk) which is suitable for sunbathing and swimming, but also for windsurfing and diving. Make sure you enjoy a beer or a delicious dish at some of the lovely bars or restaurants located in Ouderkerk aan de Amstel, such as Loetje aan de Amstel or Restaurant Jaimie Van Heije. A very accesible area that you could explore on your bike is in the north of Amsterdam and we suggest you do that on a day with less wind, and no rain for guaranteed success. You can start by taking the ferry for a short trip from Central Station across the Ij river and from there on the road is full of many possibilities. First of all, since the 19th century, this part of the city has been bustling more than you could imagine. In its beginnings it was a place for new industries and shipyards, NDSM being one of them. Nowadays many people choose to visit the north of Amsterdam for its hip cafés but also for its alternative events and festivals involving music, art, and culture. 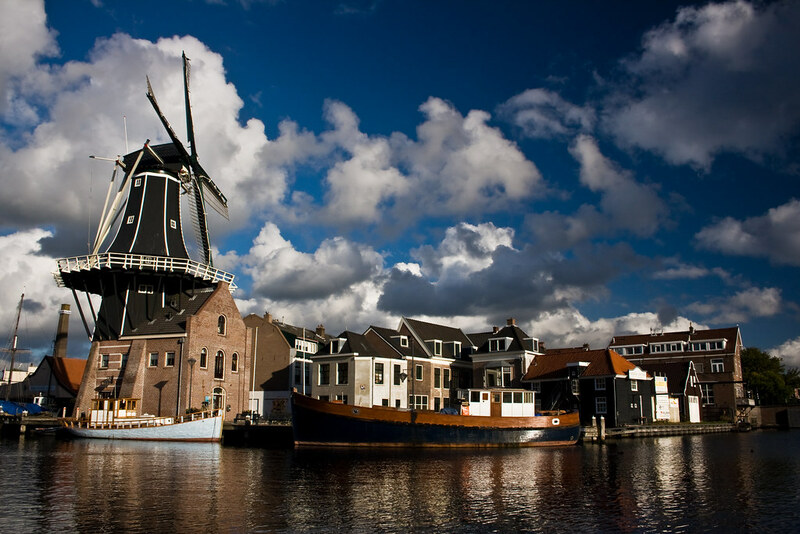 Secondly, discovering the north also means being able to enjoy nature and picturesque sceneries outside Amsterdam. If you’re into longer trips you could choose some of the northeast routes in the so-called ‘Waterland’. 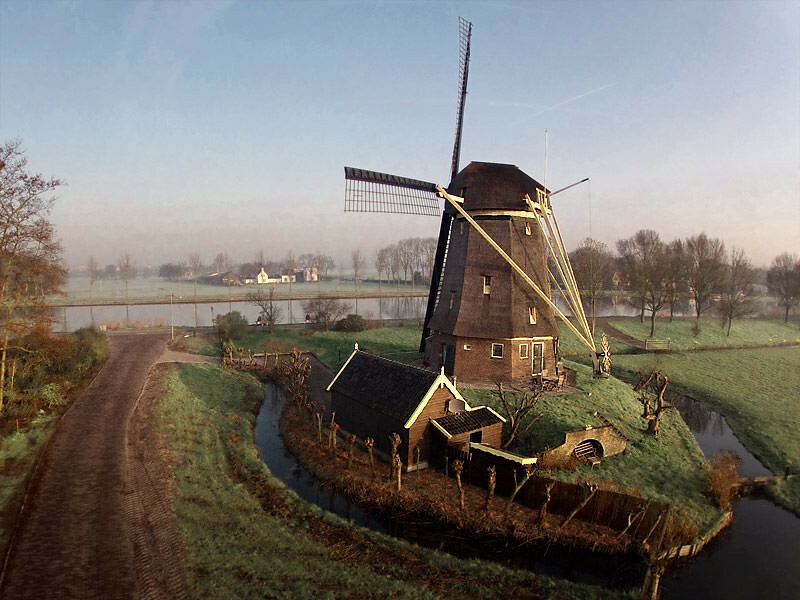 This is the home of cows enjoying green fields, ducks on canals, little white bridges, and church towers that are seen in the villages of the Waterland. We would like to recommend visiting the nine historical villages which have 391 registered monuments. Going to old villages like Zunderdorp, Ransdorp, or Durgerdam and back to Amsterdam should take you about 2 hours with a well deserved coffee / snack break. But if you’re the sporty type, you can head towards Monnickendam (famous for its smokehouses, cheese, and shipyards) and even Marken. Along the way you will definitely enjoy the views on dykes and the small harbours. The so called Amsterdam’s forest is one of our favourite places to go biking and enjoying a picnic, especially during spring and summer. It is only a few minutes away from the vibrant city of Amsterdam and situated in the south of the Dutch capital. This is a place for everyone: friends, families, dog owners, and tourists who want to escape the big city’s buzzing streets. 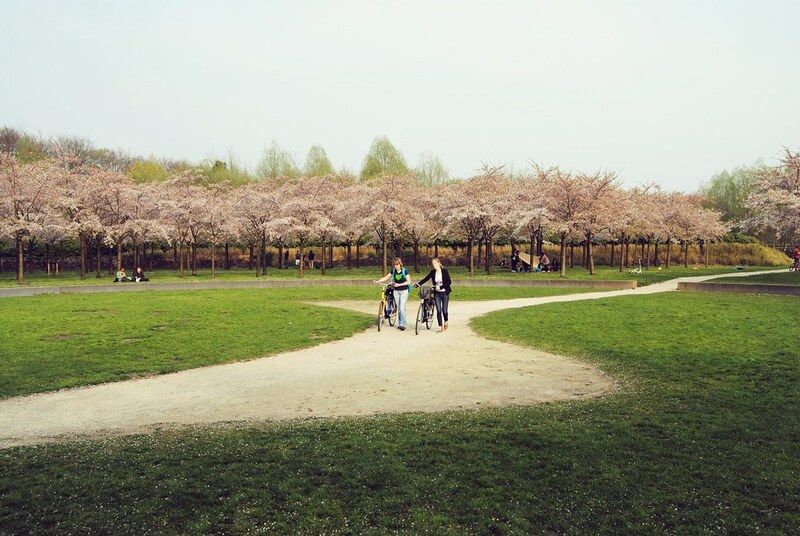 One of the special areas you can explore while on your bike is the Kersenbloesempark (Cherry blossom park). This time, we suggest taking your bike on the train from Amsterdam to Naarden-Bussum, east of Amsterdam, in the Gooi region. The ride should take about 20 minutes. Getting off the train you can cycle towards Naarden, one of the best preserved fortified towns in Europe, dating back to 1300s. The town features a double ring of 17th century bastions and moats, old houses and cobblestone streets. Some of the touristic interests of Naarden are The Great Church (Grote Kerk) and The Spanish House (Spaanse Huis), which both weere built around the 16th century. In the surroundings you can find two other fortified towns, namely Weesp and Muiden which also has a medieval castle. Another bike tour you could join is the War & Peace bike tour which is especially interesting for defence structures fans, “from medieval castle to WWII bunkers”. The best time of the year for a cycling trip is between April and October. 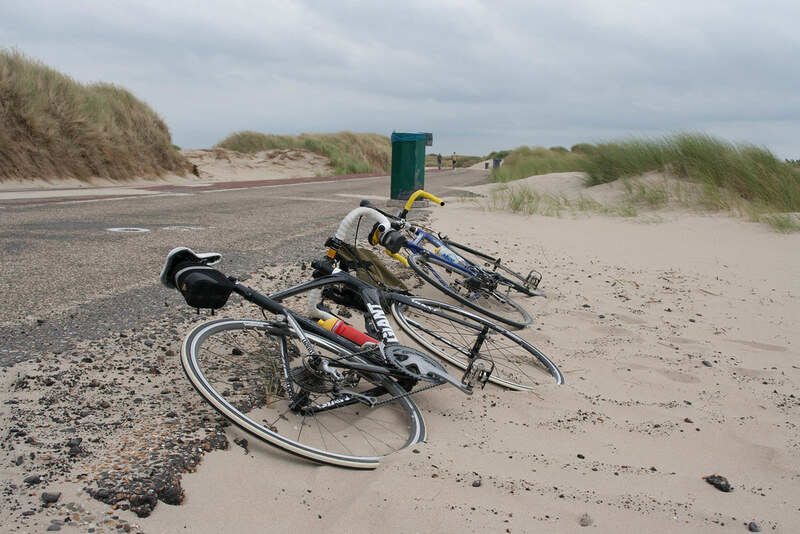 Summer days with bike rides around the Dutch dunes are perfect for both beginners and more trained cyclists. In case you’re a beginner we suggest taking your bike on a train to Haarlem where you could also enjoy the picturesque streets and beautiful city. 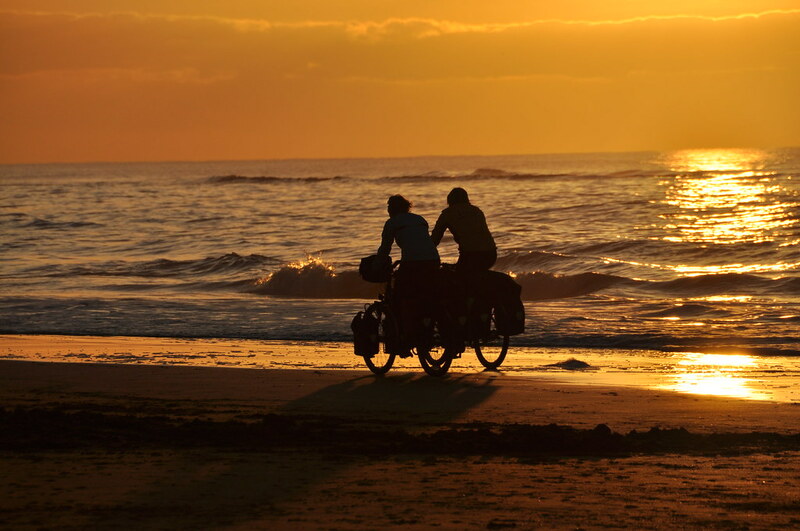 From there hop on your bike and enjoy the dunes, pass along the Zuid-Kennemerland National Park, then finally reach the beaches from Bloemendaal aan Zee and Zandvoort. Here you can sunbathe and even swim on lucky summer days 🙂 or simply enjoy a beer, watching the sunset. We hope you enjoyed FLATTIRE’s recommendations for the upcoming spring!